Brisbane (local nickname Brissie) is the seaport capital city and biggest city of Queensland in Australia. It has a population of 2.2 million people and is the third biggest city in Australia, after Sydney and Melbourne. The central city is on the Brisbane River, 23 kilometres (14 mi) inland from Moreton Bay. Brisbane is named after the Brisbane River, which is named after Sir Thomas Brisbane who was Governor of New South Wales from 1821 to 1825. A penal colony was founded at Redcliffe, 28 kilometres (17 mi) to the north, in 1824. It was moved to North Quay in 1825. The first free settlers moved to Brisbane in 1842. Brisbane became the capital city when Queensland became a separate colony from New South Wales in 1859. Brisbane has more than 50 skyscrapers more than 100 metres (330 ft) tall. Brisbane has a humid subtropical climate. Summers are hot and wet. Winters are warm and quite dry. Thunderstorms happen a lot from November to March every year. Very heavy thunderstorms caused big floods and a lot of damage in February 1893, January 1974, January 2011 and January 2013. The warmest recorded temperature in Brisbane was 43.2 °C (109.8 °F) on 26 January 1940 and the coldest was 2.3 °C (36.1 °F) on 2 July 1896. Sunshine hours are not typical for a location in the southern hemisphere. While the sunniest month, November sees over 250 bright hours, the dullest month, February, equivalent of August in the northern hemisphere, has less than 200 hours. Brisbane City Hall which has Brisbane City Council offices. The City of Brisbane, run by Brisbane City Council, covers a big part of the suburbs close to the city. 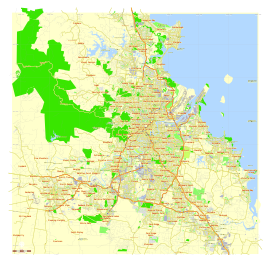 The outer suburbs are part of Logan City to the south, Moreton Bay Region to the north, the City of Ipswich to the south west, Redland City to the south east, with a small part in the Scenic Rim Region to the west. Brisbane has many universities and colleges including University of Queensland, Queensland University of Technology and Griffith University. The Australian Catholic University, Central Queensland University, James Cook University, University of Southern Queensland and the University of the Sunshine Coast each have a campus in Brisbane. There are three big vocational school in Brisbane - Brisbane North Institute of TAFE, Metropolitan South Institute of TAFE and Southbank Institute of TAFE. Most primary schools and secondary schools are run by the Queensland Government. There are also private, Catholic and other Christian schools. A rugby league game at Lang Park stadium. Brisbane hosted the 1982 Commonwealth Games, the 1988 World Exposition (called World Expo 88), and some games at the 1987 Rugby World Cup and 2001 Cricket World Cup. Big sports stadiums include the Brisbane Cricket Ground, Lang Park, Ballymore Stadium and the Queensland Sport and Athletics Centre. Brisbane has teams in all Australian sports competitions. ↑ "Ten years of growth: Australia's population hot spots". Australian Bureau of Statistics. 28 July 2017. Retrieved 4 August 2017. 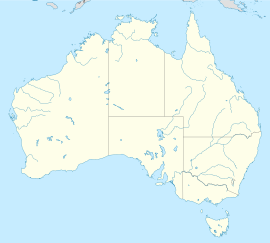 ↑ "Climate statistics for Australian locations". www.bom.gov.au. ↑ "TAFE Queensland". Queensland Government. Retrieved 2 December 2007. Wikimedia Commons has media related to Brisbane.